message ⋆ 100% Private Proxies - Fast, Anonymous, Quality, Unlimited USA Private Proxy! How can I use a content type field on the body of the e-mail message template on the Webform module (Drupal 8)? For usability matters, I would like to let the editor create his own confirmation message on my Event content type. So I create a field for that. I also have another field to select which webform is going to be used as a reference (I am doing that the same way that was done on the Event Demo that comes on the module). Is there a way to use this content type field on the e-mail handler on the webform as a token or something like that? We have two separate sql servers. On one server we have a datawarehouse DWH, on the other we have sales information. Now on the DWH server there is an ETL job that collects the information from the sales server. The job runs daily after midnight. The DWH collects the information via linked server from the sales database. Now, the most time the ETL job runs without any problems. But sometimes it failes because of query timeout. We have found out, that there is a specific pattern: The failure happens every 11th day. So on the 11th day the ETL job fails to collect information. We have searched everthing and could not found out what this issue causes. Also we know that the amout of data is everytime, almost the same. The next approach is to turn off the anti virus programm on the sales server. Does anyone have a clue or any idea, where i can search for such a problem? We have searched everthing and could not found out what this issue causes. Also we know that the amout of data is everytime, almost the same. When I select a thread and click the flag button as shown in official guide, it flags all the messages in the thread. This is suboptimal when the thread is long and contains many messages. How can I flag one single message in a thread? I am using Ubuntu 18.04 for the first time; I entered my computer password for the user root password but it doesn’t work. Is there a way I could find out the password to it? Actually is there a reason why it does not tell me to create a password since this is my first time setting this up? Please advise. I have a webpart in the master page which uses a jscript file to perform microblogging operations. This webpart has similar features like OOB NewsFeed part. There is no problem if I create a post which includes Mention, Url SocialData items, but if the message contains a Hashtag, the following exception is occured. Microsoft.Office.Server.Social.SPSocialFeedManager.CreatePost: Microsoft.Office.Server.Microfeed.MicrofeedException: InsufficientPermissions : ( Access is denied. (Exception from HRESULT: 0x80070005 (E_ACCESSDENIED)) ) The current user is not authorized to perform the operation. I tried the code example which is found in MSDN and got same exception. It works if I use this code in “MySite” collection. What should I configure to send messages including hashtags in other site collections? I’m trying to implement an Interface for a Message Queue. This interface should allow different implementations of queues to be implemented etc AWS SQS, Azure Queue Service. The QueueMessage interface will allow the implementation of the Queue to convert it into the required format. Is this the proper way to achieve this? Is the QueueMessage interface violating interface segregation principle as the queue implementation will have access to all the “To…Format” methods in addition to the one it requires? are there any ndef message poisoning attacks (like http poisoning attack )? when I say it, I mean that I have a full control on the nfc packet. Is it possible to inject another packet into a nfc payload or something. 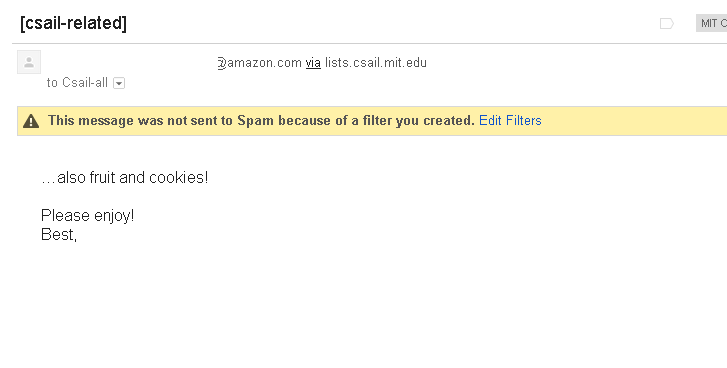 This message was not sent to Spam because of a filter you created. OK but which filter? How can I see which filter the yellow message is talking about? I don’t want to search myself. “Edit Filters” redirects to https://mail.google.com/mail/u/0/?shva=1#settings/filters.